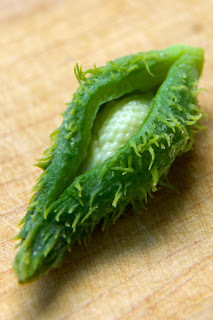 I'm so excited to announce that the featured herb for the Wild Things foraging recipe challenge (look here if you need more info about how to participate) is black walnut. You see, it is without a doubt, my favorite nut; no other can even begin to compare. I believe my taste for black walnuts is genetic, as black walnuts are my papi's favorite as well. Because he grew up on a farm in the mid-west, he's got some great stories to tell about harvesting wild foods. One of the best stories he tells is of black walnuts. Every year, the family would go pick an entire pickup truck full of black walnuts. They let them cure for a bit, then either run them through the corn sheller on the widest setting, or drive over them to remove the hulls. At that point, the walnuts would be stored in the basement until winter. It wasn't until the deepest, darkest, snowiest days of winter that the black walnuts came back out. At that time, every member of the family would get a bowl of cracked black walnuts, and they would all sit around and pick nut meats while watching tv. I've never had this experience, as black walnuts are a bit out of range here. There's a ragged tree here and there, enough to pick and savor a few nuts and sprinkle them into my favorite recipes. But never in my life have I seen the bed of a pickup filled with black walnuts. I can only imagine! I suspect one of the reasons black walnuts are scarce in the Rockies is that they prefer rich, moist soil. 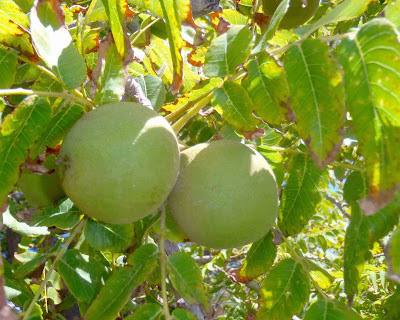 Black walnuts trees also enjoy sunny open spaces. 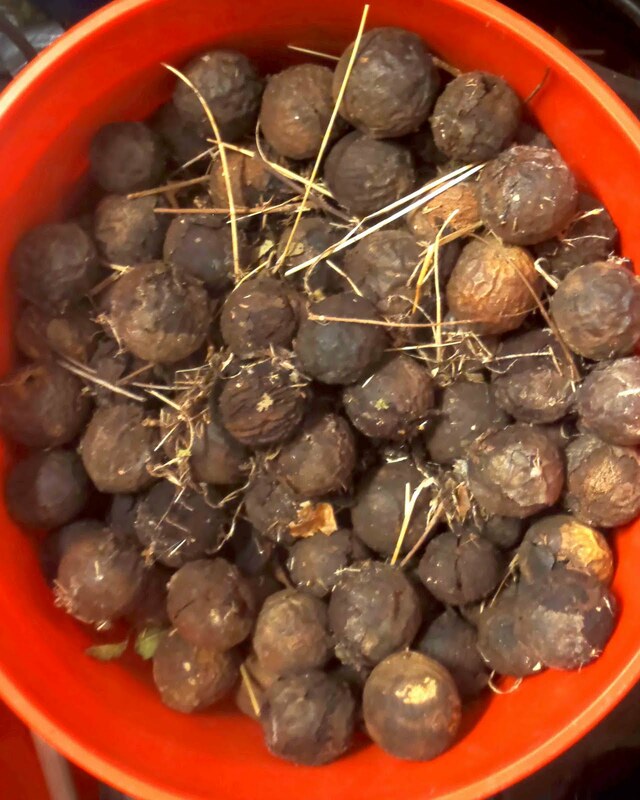 Interestingly, they contain a substance called juglone which is mildly toxic to most other vegetation, which helps black walnut trees secure that rare combination of moist nutrient-dense soil and full sunlight that they need. The bark of black walnut is so dark as to nearly be black and nubbly and furrowed. 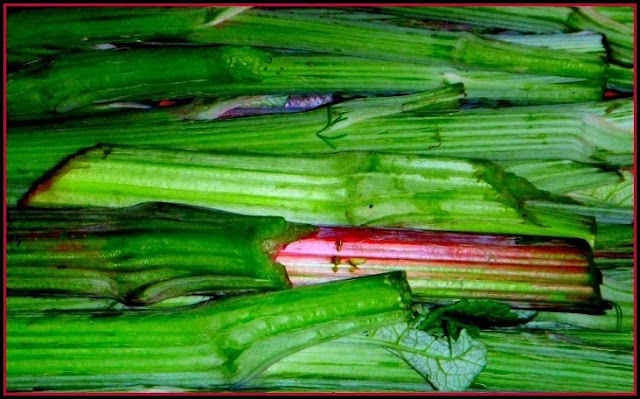 It's lance-shaped leaves and toothed leaves are arranged pinnately, with leaflets appearing in opposite pairs. The fruit of black walnut look like mini tennis balls. Young or mature, the hull stains deep brown, so protect your hands and house from the mess. Once ripe, the nuts will fall to the ground, so all you have to do is go scoop them up, and then go through the lengthy process of removing the hulls, and breaking through the tough shells to get at the meat. But oh baby, that nut meat is worth the effort. 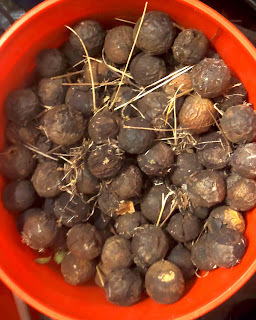 Black walnuts have a much different character than English walnuts. They possess some of the sweetness of a pecan, but have a perfume all their own, dark and earthy and so distinct. It's classic to use black walnuts in baked goods, but they also make a delicious crust on meat, or enrichment for soup. And if you are lucky enough to forage black walnuts, I'm telling you right here and now that you must make ice cream. You simply must. Black walnuts are worth wildcrafting for taste reasons alone, but don't forget that many of our favorite foods are also powerful medicine. Take a look at what my co-host, Beks of Cauldrons and Crockpots, has written about the medicinal qualities of black walnut. Wild Things is a foraging recipe challenge, and you are invited to play along. Just find yourself some black walnuts, whip up a special recipe (or two, or three! ), and email a link to your recipe to wildthings.roundup@gmail.com . There are a ton of these trees here in Virginia! Only I have no idea how to cure and shell them. Any specifics? Oh, so lucky! Once they've fallen to the ground, collect them, then lay them out somewhere in a single layer until the husk seems dry and papery. At that point, you can use a pair of thick leather gloves, and rub the nuts back and forth between your hands to remove the husk. Then, it's only a matter of getting into the shell. I've used a hammer (wear eye protection! ), Beks put them into a bag and whacked them with a cast iron skillet. They're a very tough nut, and I think a nut pick is utterly necessary for getting the meat out. Perhaps others have some good advice? Hold the fruits in both hands and twist like you're taking the lid off a jar. If the fruit is ripe, it'll just slip off. We have probably 30+ mature trees on my grandpa's old place. (now dad's) So every year there are SEVERAL hundred pounds for the picking....although the squirrels get a bunch if you don't hurry! I love black walnuts but don't often take the time to gather them. Now I'm reminded I'll have to remedy that! Jason, don't tempt me, you don't live that far away from me!!! I wasn`t fond of the sweets I made with black walnuts, but they shine in savoury dishes. I've put them in puree soup, quiche, and in biscuits with dried pears (foraged of course). The last are sort of my favourite, because they are easy to make and play up the time-honoured combination of pears and blue cheese. I eat them toasted with a slilce of swiss melted on top.